Love letter to my libraries | Kate Mahar writes . . .
Did anyone read the essay by Richard Russo in the “Parade” newspaper supplement yesterday? It was titled, “Places of Wonder” and talked about a small town book store the novelist loved to visit when he was a child. It was an excerpt from a book called, My Bookstore: Writers Celebrate Their Favorite Places to Browse, Read and Shop. It resonated with me, not because I remember a book store – I lived in towns too small for book stores when I was growing up, and the same is true where I live now – but because of my love affair with the libraries in these small towns. 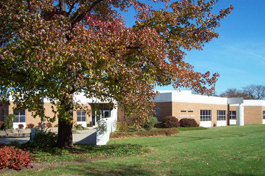 Though I was born in Cleveland, by the time I was old enough to visit a library, we had moved to the harbor area of Ashtabula, Ohio. I have vague memories of what seemed like huge buildings filled with tall shelves of books and enchantingly tiny tables and chairs, but it wasn’t until I was seven and we moved about 10 miles west to Geneva that I remember much-anticipated excursions “downtown” to the Geneva Public Library. 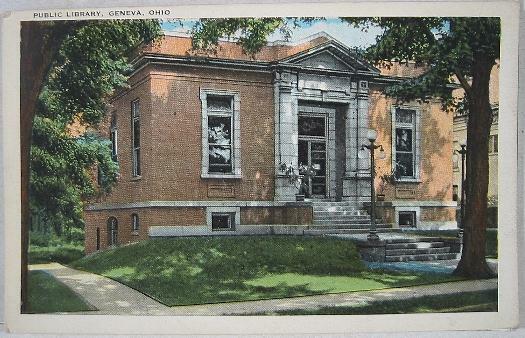 Geneva’s library was one of more than 100 libraries in Ohio built with grants awarded by the Scottish-American philanthropist, Andrew Carnegie. Between 1883 and 1929, the Carnegie Foundation helped fund 2,509 libraries in about half a dozen countries, with more than half of those built in the United States. How wonderful is that?! I am grateful to Mr. Carnegie and to the people of the Village of Geneva who had the foresight to apply for the grant that built that little library in 1908. I can close my eyes and imagine the sights and smells of the library. As you walked in the imposing front entrance (imposing by the standards of a small town little girl, anyway! ), an immediate turn to the room on the right yielded a treasure trove of children’s books. The deliciously musty scent of aging paper and creased leather bindings permeated the space, promising a seemingly endless source of remarkable stories brought to life with colorful illustrations. Sometimes in the summer we’d come for story hour, and every visit ended with a trip home with an armful of booty (thank you, Mom!). I’d be absorbed in my books for days, sometimes sneaking a flashlight under the covers at night when the story was too compelling to wait for daylight to learn how it all came out in the end. The pure pleasure of reading for reading’s sake eventually gave way to hours in school and college libraries, pouring through the Encyclopedia Britannica and other reference materials for papers and reports. Free time was spent socializing, studying, and eventually – working, raising my own child, cooking and cleaning. Reading became almost a guilty pleasure, an infrequent indulgence. I read a lot more again, and have since my son grew up and I found myself living alone. Now I make nearly weekly trips to the Madison Public Library, the wonderful source for my insatiable reading habit. I have a Kindle, but I mostly use it when I’m traveling. It’s more convenient than carrying a number of books with me, depending on how long my flights will be and how long I’ll be gone. No, it’s still the library for me. There’s nothing like walking in and knowing that I can greedily load up my bag with as many books as I like – and all at no cost. Does that continually amaze anyone else but me? I just am blown away by that. I am a Friend of the Library and donate to support special projects every year. I bake or volunteer my time to help out when the library hosts events like the recent Veterans Appreciation Day reception. But no amount of volunteer work can begin to compensate for all I receive from this wonderful place. In our digital age, I join others who are concerned about what will become of print, whether in book, magazine or newspaper form. I hope we always will have physical places to go, both stores and libraries, to have that experience of actually looking for reading materials. Sometimes the best book on the shelf is one you pick up by accident, not necessarily one that showed up on Amazon’s best seller list. It’s hard to browse like that online. The good news is that no matter what form reading takes in the years ahead, a good story will always be appreciated. Knowledge will always be powerful. And the love of reading is a gift you can give yourself every day of your life.